Variations – new combinations – that prove useful provide the foundation for adaptive renewal and entrepreneurial progress. Leadership matters because it enables adaptive adjustment to change, or initiates adaptive change to circumstances. Variations that prove useful for adaptive change and renewal are the innovations – for example in products, processes, business models, and business and institutional infrastructures – that enable entrepreneurial progress for sustainable prosperity. In the creative competition for performance and renewal, effective managerial leaders influence people to contribute to general aims in relation to an infinite variety of quadruple bottom line (QBL) outcomes: quality of life for people; competitive productivity in producing and distributing goods and services at a profit; sustainable consumption of the earth’s raw materials and stewardship of ecosystems; and adaptive innovation that sustains and renews progressive entrepreneurial change for people, profit, and planet. More precisely, effective leaders exercise the reciprocal influence that engages people in action for common purposes and mutual benefits in contingent circumstances. Leaders contribute to QBL aims and common purpose outcomes by establishing DEAR outputs: the common goals & values required for shared direction; energising reasons that engage people in action; alignment and coordination of information, decisions, and activities across the different roles and contributions of individuals and groups; and relentless reflection on processes, results, and mental models to understand and learn from them and to harness and initiate continuous variation and renewal in coordinating and evolving collective action for common purposes and mutual benefits. This is the what of managerial leadership and defines leadership responsibilities. 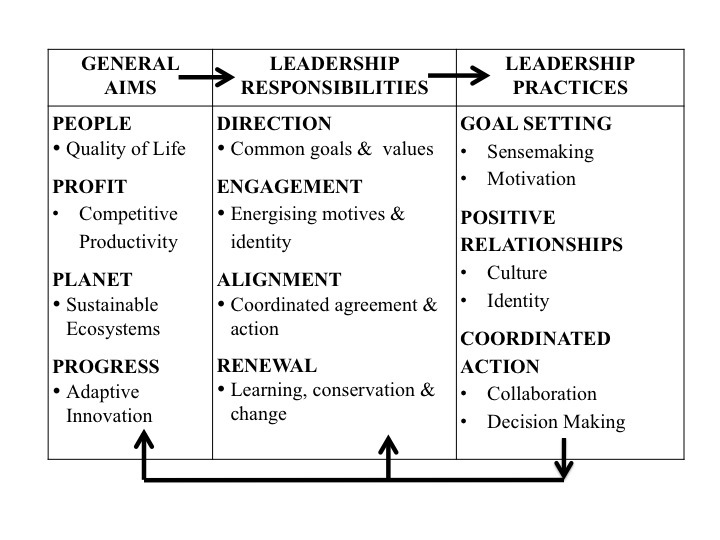 The interrelated leadership practices of goal setting, positive relationships, and coordinated action define the how of managerial leadership. These practices apply across all contexts of leadership: frontline delivery; operational systems; strategic competitive position; and institutional legitimacy. All aspects of these practices are informed by the evolving dynamics of cooperative and competitive relationships in the implementation and innovation tasks of competitive performance and renewal.